How Do You Buy the Right Baseball Bat? Choosing the right wood baseball bat can be a very confusing process. Today with all of the different options and technologies being offered what seems like an easy process can become a daunting task. With some key knowledge and a little research, buying the right wood bat can be an easy and rewarding experience. Weight A bat is measured in its “drop.” A bat “drop” is a negative number showing the bat's length to weight differential. For example if a bat is 33 inches and has a drop weight of (-3) the bat will weigh 30 ounces. The bigger the drop weight, the lighter the bat will be. Adult wood bats are usually -3 while youth bats can be anywhere from -5 to -7. As a general rule, bigger, stronger players usually prefer a heavier bat for maximum power. Smaller players usually benefit from a lighter bat that allows greater bat speed. To determine the weight that’s right for you, swing a variety of bats and see how much weight you’re comfortable with. Length and weight combine for peak performance. A longer bat gives you greater reach, allowing you to hit balls on the other side of the plate. But remember that a longer bat may be heavier, and the extra weight could slow you down. You need to swing bats of different lengths to decide which length best suits you. Maple is a very hard, dense wood. The surface hardness is 15% to 25% greater than Ash. 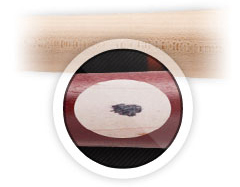 This results in a bat that has a very high level of durability and is the reason it has become so popular. Maple wood bats have less give so more energy is used to propel the ball versus being absorbed by the bat. Maple is a tight grained hardwood, and that prevents the wood from flaking or separating resulting in a tougher and more durable bat. This hardness also leads to a very high rebound effect in terms of the reaction of the baseball off the bat upon contact. The hard wood results in the the ball traveling up to 10-15 feet further then with a less dense wood. Maple bats are very smooth and if you run your hand over them you can tell how tight the wood is. The grains are less visible, which gives the bat a shine. Maple bats will give you that extra power that you’re looking for. Ash is a medium hard wood with a wider grain structure than other woods. This makes the grain of the bat very visible and results in a bat that has a high level of flexibility, a softer feel and a lower level of hardness and durability. The flexibility creates additional bat whip through the hitting zone and also leads to a very high trampoline or spring board effect in terms of the reaction of the baseball off of the bat upon contact. One of the additional aspects of ash bats is that the increased flexibility leads to less splintering or flying apart upon breaking. Birch is a very hard and flexible wood. The surface hardness is 15% to 25% greater than that of Ash but is more flexible than Maple. This results in a bat that has a high level of durability as well as a good level of flexibility. Birch is a slightly wider grained wood than maple and more tightly grained than the ash. Birch provides both a flexible and durable bat. This unique combination of flexibility and hardness leads to a high trampoline effect in terms of the reaction of the baseball off the bat upon contact. One of the additional aspects of these bats is that the increased flexibility leads to less likely splintering or flying apart upon breaking. Composite Wood bats are made up of different wood blends that are laminated to an inner support that is not usually made from a solid wood billet. This means that composite wood bats will give you similar results as a standard wood bat, but are more durable and last longer than traditional wood bats. Composite bats are often legal in wood bat leagues or BBCOR certified leagues. High-end maple and birch wood models will have what’s called an “Ink Dot Test” applied to them. This Ink Dot demonstrates "Slope of grain" which is a wood-industry term that defines how straight the grain runs along the edge and flat faces of a piece of wood. The more it runs diagonally, the easier chance it has to splinter across that line. If it runs straight through the bat from handle to barrel, the less chance there is of the bat breaking. The straighter the grain the better the durability the bat should exhibit. Whichever side of the bat the test is applied will be the hardest side of the bat. A wooden bat is crafted from natural materials, like any natural material, it breathes and takes in the environment it is exposed to. Extreme moisture and prolonged exposure to heat or cold is not a bat's friend. Take your bat indoors (the garage does not count as indoors!) after each time out. Lean it up against a corner in as straight an up and down position as possible.